Ever heard the saying, 'Better late than never'? Of course, you have. One way of looking at that is you're late and therefore have missed out on an opportunity. Another approach is that you've taken your time to analyse a situation thoroughly and understood that it is worth your time and effort to make an entrance. I'm not sure which one Honda has been doing, but either way, they've never been too eager to jump into a trending segment. For instance, they took their time to bring out the BR-V in the compact SUV segment and now, after quite a while, they've brought out the WR-V in the compact crossover segment. But hey, it's finally here and, like I said, it's better than never. 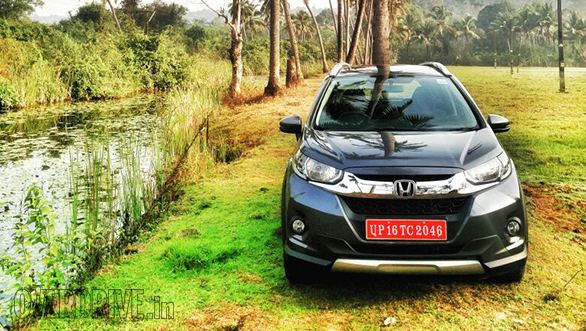 And we're in Goa to find out if all of Honda's time and effort have borne something worthwhile. Due credit must be given to Honda for ensuring that the car looks significantly different from the Jazz, unlike rival manufacturers with their compact crossovers. The front is all-new with a rather burly design that is inspired by the BR-V. 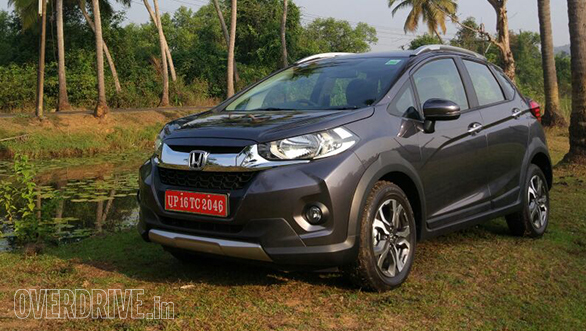 The Honda WR-V's bonnet is significantly higher than in the Jazz while the nose is flatter. It also gets the thick chrome garnish on the grille like all the new Hondas. The headlights, which integrate into the chrome garnish, feature LED DRLs and remind me of the BR-V. The Honda WR-V looks quite butch if you ask me, thanks to the plastic cladding and faux bash plate at the bottom of the bumper. From the side, however, it's hard to miss the almost identical shape of the Jazz, right from the large windows to the strong character line running across the doors. The most noticeable differences are the plastic cladding along the wheel arches, the roof rails and the larger 195/65-section tyres with nice-looking 16-inch diamond-cut alloys. At first glance, the rear looks quite different from the Jazz with the new 'L' shaped tail lights, the repositioned number plate holder and the faux bash plate. However, closer inspection will reveal that some of the elements like the overall shape of the boot lid are identical to the Jazz. Overall, Honda has managed to make it look a little more sporty and a lot less minivan. 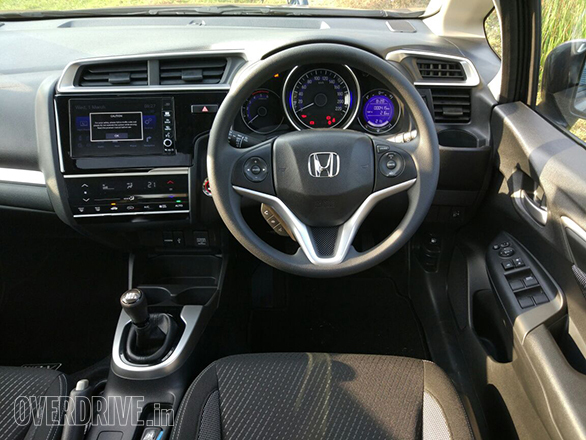 Unlike the outside, the interior of the WR-V doesn't see much change from the Jazz. You get the same asymmetrical black dashboard with a touch-pad climate control unit, and the neat, large part-digital instrument cluster. You also get the same large dashboard which makes front and sideline visibility quite a hassle. What is new, however, is the gear lever and upholstery which will be available in two colour schemes - black with blue or black with silver. The WR-V also gets features like a new 7-inch touchscreen infotainment system and a segment-first sunroof. The infotainment system's user interface is all-new too. It is an Android-based system, which is evident from the way it looks and feels, and supports Wi-Fi connectivity if you connect a Wi-Fi receiver to the USB port. So you can access websites from the system's built-in browser using an Internet connection from your phone's hotspot or from a dongle. In terms of safety, the WR-V will get ABS and dual front airbags as standard features, so full marks to Honda for that. However, it does lose some of those marks because the rear passengers don't get adjustable headrests, making rear-collision safety for them quite poor. Honda's 'man maximum, machine minimum' philosophy ensures that there is ample space inside the car. There are quite a few storage spaces available too. But more importantly, the WR-V's wheelbase is 25mm longer than the Jazz, while overall length has gone up by 44mm. This has just made an already spacious car even more spacious with very impressive kneeroom. Boot space has also increased by nine litres with a capacity of 363 litres. However, Honda is neither offering the Magic Seats like in the Jazz, or 60:40 split seats. As expected, the WR-V gets the same engines as the Jazz. That means a SOHC 1.2-litre i-VTEC petrol that produces 90PS at 6,000rpm and 110Nm at 4,800rpm as well as a DOHC 1.5-litre I-DTEC turbo-diesel that puts out 100PS at 3,600rpm and 200Nm at 1,750rpm. The diesel gets a 6-speed manual and the petrol gets a 5-speed manual - however, there is no CVT option like in the Jazz. The diesel engine has got good low-end grunt and with a responsive throttle, it will happily trudge along at 25kmph in third gear. The engine is quite free-revving and the linear power delivery makes the car quite enjoyable, if not exciting, to drive around. The gearbox is typically Honda with a precise 'click-click' when you shift gears, while the light and progressive clutch is nice to use in stop-and-go traffic. Additionally, the 6-speed makes the WR-V a comfortable and effortless highway cruiser. While Honda didn't give us any figures, they are claiming best-in-class acceleration figures. 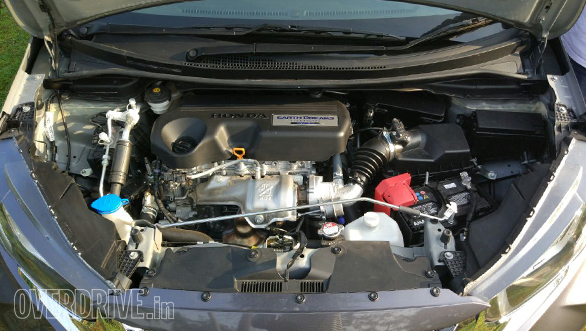 They are also claiming that the WR-V diesel will offer segment-leading efficiency with a figure of 25.5kmpl. This is 1.8kmpl less than what they claim for the Jazz. Apart from the extra 50kg that the WR-V carries, this could also be down to the gearing which, Honda says, has been optimised for better acceleration. But we'll have to wait for the road test to get real-world figures. What is obvious is that the engine is still as loud as it has always been. NVH levels are quite poor in the cabin and that's personally quite off-putting. On the contrary, the 1.2-litre petrol engine is super refined and creamy. It's very quiet till around 4,000rpm at which point the sound turns to a nice raspy note which gets louder as you get to the redline. That said, the sound is the only exciting thing about it. The engine feels annoyingly underpowered and you really have to rev the nuts off of it for some decent acceleration and that can get quite annoying especially during overtakes. This, despite Honda saying that they reworked the gearing for better acceleration. That said, it shouldn't be too much of a problem within the city. The precise gearbox and the light clutch only make the experience that much nicer in slow-moving traffic. 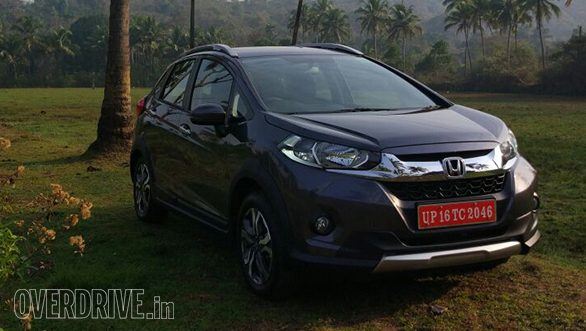 Honda is claiming that the petrol WR-V will return an overall average of 17.5kmpl which is quite respectable. 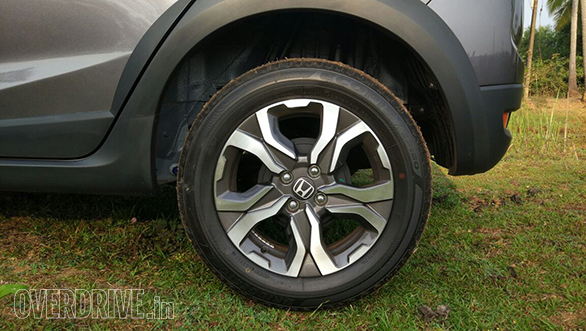 The most significant mechanical update in the Honda WR-V is the suspension. The new set-up and the larger tyres raise the ground clearance to 188mm from the Jazz's 165mm. Ride quality certainly feels more supple than the Jazz, and it absorbs potholes quite well without any thuds. That's also got to do with the larger-profile tyres. Damping is neither too soft nor too firm, so the car doesn't feel bouncy or jumpy over undulations. But around the bends, the car does tend to roll a little when you start to push it. 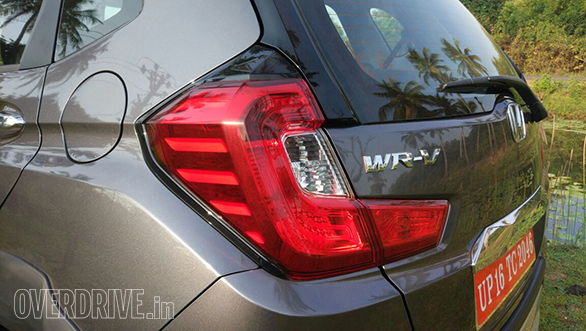 However, at normal driving speeds, the Honda WR-V feels safe and confident. For reference, it feels around 30 per cent less stiff than Maruti's Vitara Brezza and therefore a little less nimble too. The electric steering offers good feedback but feels quite vague. But it's neither too light nor too heavy and weighs up well at higher speeds. The Honda Jazz has always been a very practical family car for India. The WR-V with its higher ground clearance and improved ride quality only makes the deal that much sweeter. Thankfully it looks significantly different from the Jazz too, at least from the outside, so we're not bored of what we're looking at. The diesel variant, despite being noisy, is still quite nice to drive around in the city and on highways. The car is set to launch on March 16, and we expect it to be priced around Rs 70,000 more than the Jazz. Anything more and it would be hard to justify the additional cost. So that puts the price range of the Honda WR-V between Rs 6.50-10.50 lakh, ex-showroom Mumbai, which, compared to its rivals, is a bit on the steeper side.